This simple and delicious Shepherd's Pie recipe is made from only five ingredients, so it's very quick to put together. You can have this dish on the table in under 50 minutes from the time you start! To make it even faster, use frozen vegetable crumbles that are sold as a substitute for ground beef. Just cook the onion in a tablespoon or so of olive oil, then add the frozen crumbles and cook until heated. Then continue with the recipe. 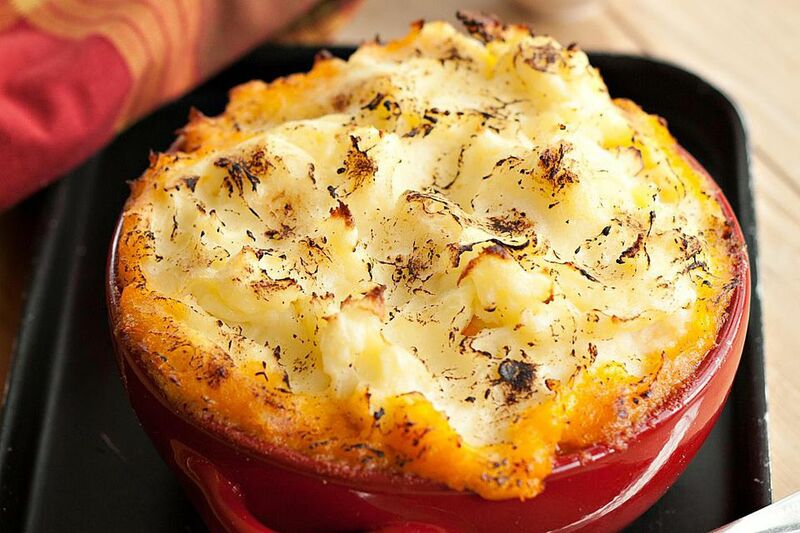 Shepherd's Pie is an English recipe that was invented to use up leftovers. You can certainly use any leftover vegetables you have on hand in this easy recipe. Leftover cooked carrots, peas, broccoli, green beans, or cauliflower would be delicious. You can substitute leftover cooked steak or roast beef, cut into cubes, for the ground beef. You could even use pork sausage or ground chicken or turkey in place of the ground beef. Use your imagination and what you have in the fridge and freezer! For the potatoes, use refrigerated mashed potatoes you buy in the store, or make good use of your leftovers. If I don't have leftover potatoes, I find that the dried potato flakes are a perfectly good substitute when rehydrated, especially when dressed up with some sour cream. Preheat the oven to 375°F. Spray a 9-inch deep dish pie plate with nonstick cooking spray and set aside. In a heavy skillet cook ground beef and onion over medium heat until the beef is browned and the onion is tender, stirring to break up meat, about 10 minutes. Drain well. Stir in the frozen vegetables and soup and cook until hot, about 4 minutes, then add marjoram and salt and pepper to taste. Pour this mixture into the prepared pie plate. Spoon the mashed potatoes over the hot meat mixture. Bake for 35-45 minutes until potatoes are golden brown and pie is bubbling.